Lady Margaret Mar, Chair, Forward ME. We are pleased to be able to let you see the results of the recent survey conducted on behalf of Forward-ME. All the raw data was analysed and inserted into a comprehensive report by Professor Helen Dawes and Her team at Oxford Brookes University. Forward ME, Executive Summary, April 2019. Bearing in mind that this survey was organised at very short notice and that we are aware that there are some shortcomings – such as a selective bias in that only people with on-line access and the ability to complete the questionnaire were included – we are very grateful to all who responded so quickly. Forward ME Executive Summary (reproduced below). This survey was commissioned by Forward ME following discussions between the Chair and Vice-Chair of the NICE Guideline Development Group, Members of Parliament and the Chair of Forward-ME about the lack of up-to-date data about providing additional patient evidence relating to long-term outcomes and harms following Cognitive Behavioural Therapy (CBT) and Graded Exercise Therapy (GET). The survey was designed by a steering group of Forward ME members and an independent research unit within Oxford Brookes University, Oxford Clinical Allied Technology and Trials Services Unit (OxCATTS), was engaged to undertake the survey, collate, analyse and report on the response. Due to the short timescales involved, the survey was only available online and it was not possible to allow paper responses. Please note, this will mean that a number of people with ME, particularly those who are severely affected, will not have been able to have their experiences considered. The survey was designed to gather evidence from people who have been offered CBT and/or GET based on the current NICE Guidelines since 2007. Much of the evidence received echoes what we already know from previous surveys and feedback received by charities over a number of years. The full report follows this executive summary. We set out below the key findings that we have drawn from it. We acknowledge that there may be some bias in the results of the survey due to its promotion by ME charities rather than NHS organisations. There are also limitations in self-reported data however we feel the scale of the response demonstrates the strength of feeling and harm on the issue. 2,274 survey responses were received. Of these, 80.4% identified as female and 16.0% as male, with the remaining choosing ‘non-binary’ or ‘prefer not to say’. 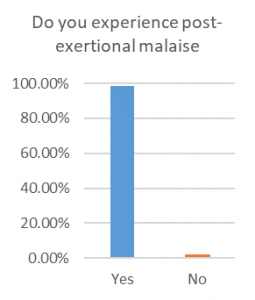 98.5% said they experience post-exertional malaise. This is shown in the chart opposite. 8% were aged 18 or under and the age band with the highest responses rate was 41-50 at 26.6%. 789 people said they were offered a course of CBT with 84.9% starting the course. We asked whether any symptoms worsened because of the treatment. 46.6% said yes and 48.5% said no. The most common symptoms mentioned were fatigue and pain. 21.6% also developed new symptoms. We asked people ‘‘what severity is their condition both before and after treatment?’. The percentage of people describing their condition as severe before treatment was 10.9% and this increased to 19.1% after treatment. 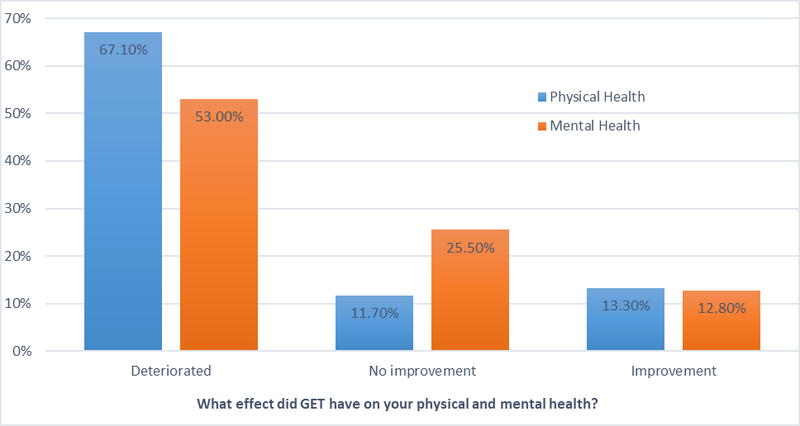 Of those who started the course, we asked ‘what impact did CBT have on their physical and mental health?’. See results in chart. 542 people said they were offered a course of GET with 79% starting the course. We asked whether any symptoms worsened because of the treatment. 81.1% said yes and 13.3% said no. The most common symptoms mentioned were fatigue and pain. 36.7% also developed new symptoms. We asked people ‘‘what severity is their condition both before and after treatment?’. The percentage of people describing their condition as severe before treatment was 12.9% and this increased to 35.3% after treatment. 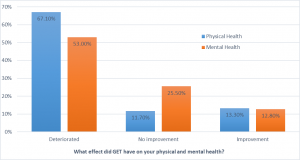 Of those who started the course, we asked ‘what impact did GET have on their physical and mental health?’. See results in chart. 943 people said they were offered a course of CBT with GET combined with 76.9% starting the course. We asked whether any symptoms worsened because of the treatment. 58.3% said yes and 37.7% said no. The most common symptoms mentioned were fatigue and pain. 29% also developed new symptoms. We asked people ‘‘what severity is their condition both before and after treatment?’. The percentage of people describing their condition as severe before treatment was 12.6% and this increased to 26.6% after treatment. 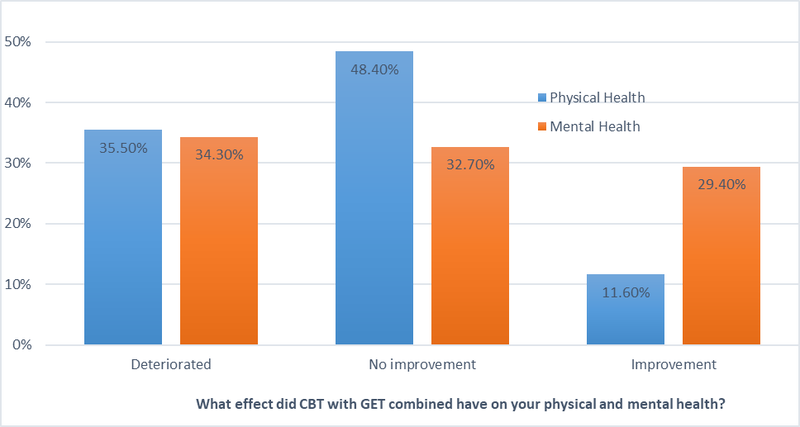 Of those who started the course, we asked ‘what impact did CBT with GET combined have on their physical and mental health?’. See results in chart. 943 people said they were offered a course of GET with CBT with 75% starting the course. We asked whether any symptoms worsened because of the treatment. 85.9% said yes and 10.3% said no. The most common symptoms mentioned were fatigue and pain. 44.4% also developed new symptoms. We asked people ‘‘what severity is their condition both before and after treatment?’. The percentage of people describing their condition as severe before treatment was 13.2% and this increased to 41.9% after treatment. 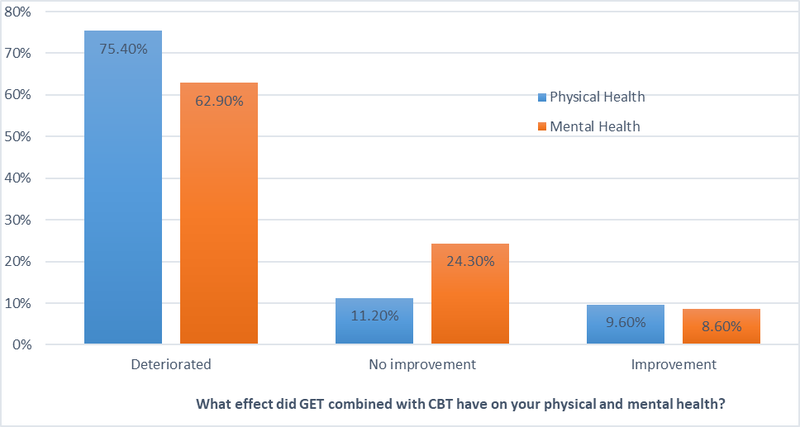 Of those who started the course, we asked ‘what impact did GET combined with CBT have on their physical and mental health?’. See results in chart. CBT, while may be effective for a minority in helping with mental health challenges such as depression or anxiety, is shown to be ineffective in a considerable proportion of people and even led to almost half of respondents reporting worse symptoms. GET is shown to cause considerable deterioration in physical and mental health. It has led to people becoming more severe and the open questions have given us insight into the worsening symptoms that have developed when patients have increased their activity beyond their capabilities. The results show that although NICE might not recommend GET for the severely affected, they are clearly being given GET at the clinical level. This could be because clinics are not tailoring their management advice to the individual (as NICE recommends) or are simply not aware of the unsuitability of aerobic/exercise for people with ME/CFS. Alongside this the analysis of the survey provided by Oxford Brookes University show that people with ME/CFS have experienced negative effects with regard to welfare and benefits when choosing whether or not participate in these treatments. Results also show that the adverse effects of the treatment has had a considerable impact on the employment and education capabilities of individuals. We acknowledge that there may be some bias in the results of the survey due to the promotion of the survey being organised by ME charities rather than NHS organisations. There are also limitations in self-reported data. However, we feel the scale of the response demonstrates the strength of feeling and harm on this issue. As there is a commitment that this new guideline be ‘patient led’ we believe that the responses should carry considerable weight in the consideration of effective treatment or management approaches. There is also an ethical question¹ whether the current management recommendations relating to CBT and GET can continue while the development is underway when their unsuitability is evident. Our collective recommendation is that GET and CBT be removed from the NICE guideline for ME/CFS. Forward-ME consists of a fairly broad spectrum of charities and voluntary organisations invited by the Countess of Mar to meet from time to time. 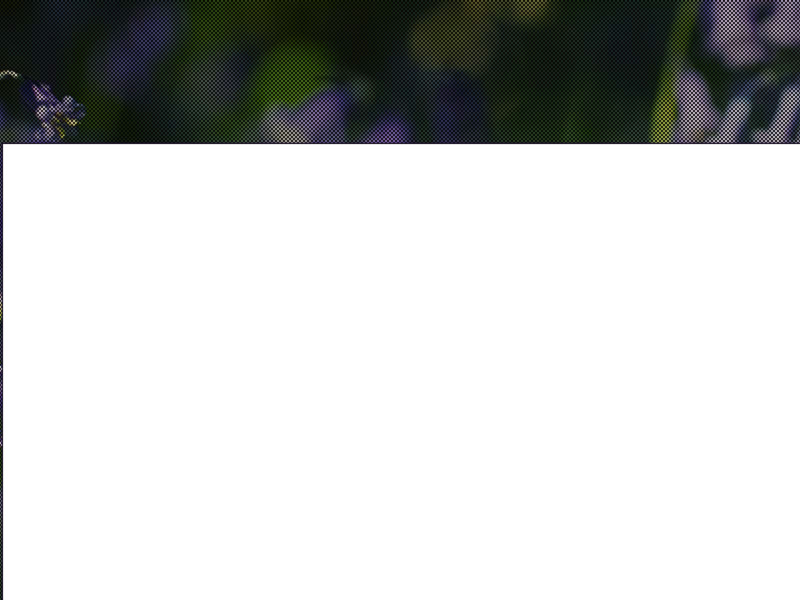 The Aim of Forward-ME is to promote effective joint working by ME and CFS organisations to maximise impact on behalf of all people with ME and CFS in the UK. Forward-ME has no formal constitution. It exists to improve recognition, understanding, research, management, support and information for everyone whose life is affected by ME and CFS. 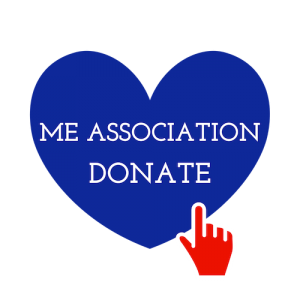 The patient survey, analysis by Oxford Brookes University and final report were paid for by the ME Association and ME Research UK. Countess of Mar (Chair), Carol Monaghan MP (vice chair), Dr Nigel Speight, Dr William Weir, Dr Nina Muirhead, ME Association, ME Research UK, Action for ME, TYMES Trust, reMEmberCFS, BRAME, ME Trust, BRAME, 25% ME Group, #MEAction. Should any notice be taken of this request to take CBT/GET off the agenda “Our collective recommendation is that GET and CBT be removed from the NICE guideline for ME/CFS”. It is quite likely that the CBT/GET proponents will simply change the names of the therapies and carry on regardless. Outlawing any increasing activity therapies under whatever name might be a good idea.